Adding beautiful sounds to your life! We are professional musicians who enjoy playing corporate events, weddings and receptions, restaurant brunches, and church services. 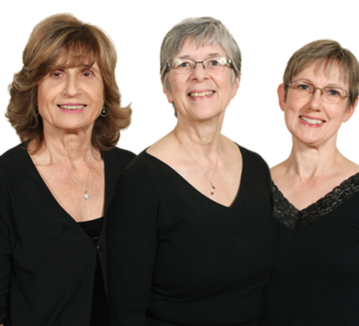 Our quartet/trio has rehearsed and performed together as a group for 15 years, providing a polished and beautiful sound that is sure to impress. Our repertoire includes a wide variety of musical styles including standard, popular, classical, Broadway shows, and music from various countries. You can save on your reception rate when you book your wedding with us! "We have used Quartet Louisville for many special occasion parties and have always been very pleased with the response from our patrons. They play upbeat and familiar music along with appropriate Italian selections." "Trio Louisville performed for our Sunday Brunch during the fall, winter, and spring seasons and returned the following winter. Everyone enjoyed them and we heard many excellent comments from our patrons. They have a large fan base which increased patronage at Captain's Quarters. They are to be commended." "The music so far exceeded my expectations that I'm still a little stunned at how exquisite it all was. I wish that I could remember all the comments that were made to us about the music so that I could pass them along to you. I find myself replaying the ceremony over and over just to hear your beautiful music." "The group beautifully played a nice variety of music, including Italian, enhancing the dining experience for our customers. We received many positive comments, and on the nights that they performed, business increased by 10% - 15%"
"I have received numerous compliments on your abilities and the ambiance that was created during both the ceremony and reception." "It was wonderful to have such personal, warm and intimate melodies contribute to such a special time in our lives. We will sing your praises every chance we get!!" In 2013 Google selected one website from each of the 50 states to feature in their GYBO (Get Your Business Online) Program. Quartet Louisville was chosen to represent Kentucky. Google hosted representatives of the small businesses in Washington DC. Lorna Larson, founder and 1st violinist, and Robin Chappars, cellist & business manager, represented Quartet Louisville at the inaugural reception, conferences, training sessions, and meetings with representatives of the Small Business Administration and the staff of KY Senator Mitch McConnell. In October, 2014, Trio Louisville was pleased to provide music for the Carson Massler-Blaine Lawrence wedding with Blaine’s famous sister Jennifer Lawrence as a bridesmaid. The wedding is the cover feature in Martha Stewart’s Real Weddings Special Issue (Spring 2014). "If you want to experience beautiful stringed music with or without audience participation you need to reserve Trio Louisville for your next event. The residents, family members, volunteers, staff and visitors enjoy the sound of Trio Louisville during Wine and Cheese, Mother’s Day Tea Party, Volunteer Appreciation Luncheon, elegant dinner parties, weekly Happy Hour, and many more. The Trio Louisville offers a variety of themed music for any special event. Stop by The Episcopal Church Home on the third Thursday of any month and listen to Trio Louisville as they make life worth living for our senior adults." "​Trio Louisville was a fine addition to our Selena's 'family' for almost three years. They professionally performed each Sunday for our brunch, indoors or on the patio, providing a wide variety of music including popular, show tunes, semi-classical, jazz and country. During holiday periods the group would also feature appropriate music for the season. It was a perfect collaboration of great food & music. Many music requests were made by our patrons, and with the group's large repertoire the request was nearly always met."